""Forty-three years on the road, and more," said Cast-iron Billy; "and, but for my 'rheumatics' I feel almost as 'ale and 'earty as any gentleman could wish. But I'm lost, I've been put off my perch. I don't mind telling of you I'm not so 'andy wi' the ribbons as in my younger days I was. Twice in my life I’ve been put off, and this finishes me. I'll never hold the whip again that's been in my hand these three and forty year, never! I can't sit at 'ome, my perch up there was more 'ome to me than 'anythink.' Havin' lost that I'm no good to nobody; a fish out o' water I be." 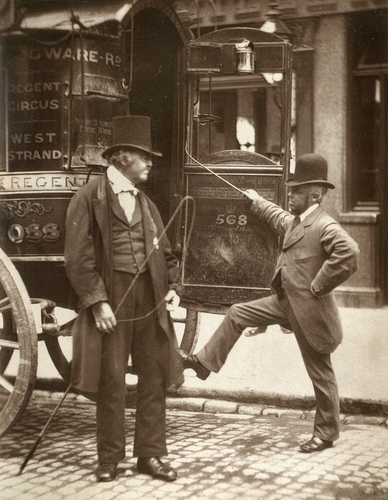 "The subject of the photograph lost his position as driver owing to his inability to cope with younger men driving opposition omnibuses along the same route. In this instance the omnibuses crossed each other, the younger and more active man so taking the lead as to pick up all the passengers. This was not all, our veteran had become so enfeebled as to require help to mount his perch, while the reins had to be secured to his coat, as he has partially lost the use of his left hand."